The T-Bar LED is a lighting system that can be integrated into suspended ceilings. This high performance lighting system has been created in the shape of a T-BAR to allow it to be designed or retrofit into ceilings. Thanks to the engineering and patented technology, the junction point temperature of the LED is maintained below the maximum rating allowed by the LED manufacturer, insuring product longevity. The T-BAR LED™ is a step into the future, changing the way we illuminate our spaces, and improving the world in which we live, work and play. The T-Bar LED is available with reflector, diffuser or lens options, allowing an area to be lit according to specific requirements. The T-BAR UP offers indirect lighting. Utilizing JLC-Tech’s patented technology he T-BAR UP provides ambient uplight while only extending 2” below the ceiling plane. The minimalist low profile lighting leaves the space above the ceiling completely unoccupied and facilitates the coordination of placing other ceiling utilities. 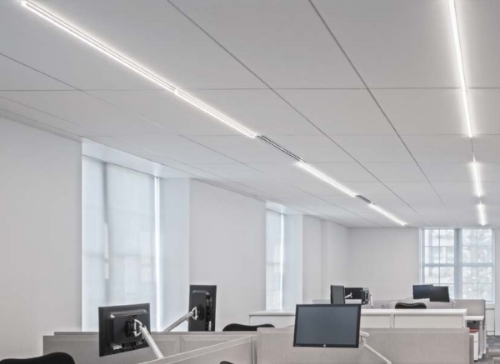 The clean modern lights occupy the grid allowing for the use of uninterrupted ceiling panels, creating a uniform ceiling design and optimizing sound absorption and light reflectance. The installation is a snap and requires little to no tools or field cutting of tiles. Third party studies have found that the cost of building materials and labor are reduced by nearly 50% when using the T-BAR LED in comparison to other lighting. The versatile lighting can be placed in the ceiling where light is needed or desired, resulting in a more even illumination and the ability to achieve the lumens required.